My homemade apple pie recipes are fantastic. Buttery and flaky crust - the filling is spiced perfectly with cinnamon and sugar. Try a warm apple pie slice with my old fashioned vanilla ice cream and homemade caramel sauce; pure heaven. This photo reminds me of my childhood. Fond memories indeed. 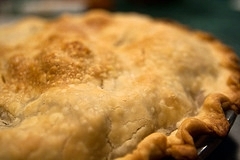 I have the perfect pie crust listed first and following are the recipes to fill them up with. This is THE BEST and easy apple pie recipe you will go to from now on. Promise. In a bowl, combine flour and salt; cut in shortening or butter. Gradually add the cold water 1 tablespoon at a time tossing with a fork until it forms a ball. Chill dough for 30 minutes. On a floured surface, roll out 1/2 of the dough into a 10 inch circle. Place into your pie pan. Spoon in filling. Roll out the other 1/2 of the dough for the top of the pie and cut slits in the top. Place over filling, seal and flute edges. Beat egg yolk and water and brush over pastry. It's ready to go into the oven. Slice apples and place in 8 inch pin tin. Add the sugar and cinnamon. Combine the ingredients - it will become a thick batter. Spoon and spread on top of the apple mixture. Bake for 40 minutes. May be doubled for a large pie tin. 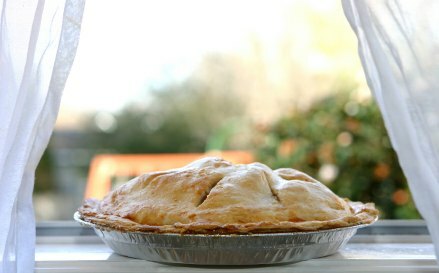 Another delicious and easy homemade apple pie recipe with a twist that will knock your socks off...Yes that good. A custard-like filling and spiced apples are to die for. NOTE: Regular milk may be substituted for the evaporated milk. In a bowl, combine the apples, flour, cinnamon and apple pie spice; mixing well. Pour the cooling milk mixture into the pie plate and arrange the apple mixture evenly over that. Top with the second crust, seal and flute edges. Cut slits in the top crust. Bake for 30-40 minutes or until edges are golden brown and the apples are tender. Cool for 30 minutes. Beat or whisk the frosting ingredients together and pour over the warm pie. 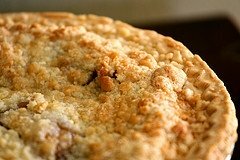 A tasty and easy homemade apple pie recipe for your recipe box. Beat eggs and place in a 1 cup measuring cup. Fill with milk or cream to the top. 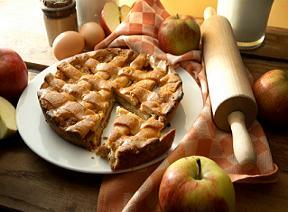 Place the quartered apples to form a circle in the bottom of the pastry-lined pie plate until filled. Cover with the mixture of sugar, flour, salt and cinnamon. Pour over the milk and egg mixture. Bake for 5 minutes and reduce oven temperature to 350 degrees. Continue baking until apples and custard are done. 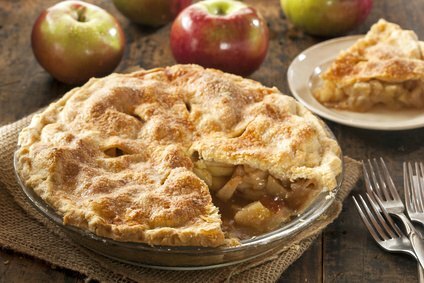 A fast cooking apple is most suitable for this homemade apple pie recipe. I really love the cinnamon in the pie crust. Filling - Peel, core and slice apples. Mix 3/4 cup of sugar, the water and the vinegar together in a saucepan and bring to a boil. 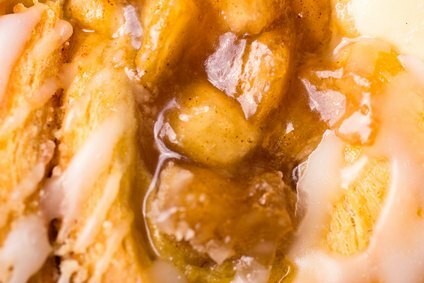 Simmer apples in this syrup until tender. Drain syrup back into the pan and let apples cool in a bowl. Mix remaining sugar, flour and salt together. Blend in with the reserved syrup and cook until it thickens. Add butter and vanilla. Cool. Pastry - Sift salt, cinnamon and flour together. Cut in butter (or shortening). Add just enough water to hold pastry together. Roll out lower crust and line a 9 inch pie pan. Chill. Fill chilled pastry with cooled apple mixture. Use remaining pastry to make a criss-cross top. Bake for 30 minutes or until nicely browned. One of my homemade apple pie recipes includes this gem. In a bowl, combine flour, cinnamon and salt; cut in shortening (or butter if using). Gradually add the cold water 1 tablespoon at a time tossing with a fork until it forms a ball. Chill dough for 30 minutes. In a bowl, toss apples with lemon juice. Combine sugar, flour, cinnamon, salt and nutmeg - add the apples and toss together. Pour into the pie crust and dot with butter. Roll out the other 1/2 of the dough for the top of the pie and cut slits in the top. Place over filling, seal and flute edges. Fit the pie crust into your pie pan. In a large bowl, combine the sliced apples, lemon juice, both sugars, flour, cinnamon and nutmeg. Fill the pie crust with this mixture. To make the topping - with a pastry blended or fork, mix together the flour, both sugars and the butter until coarsely crumbled. Sprinkle over the apples. Bake the pie for 50 minutes. Serve warm or cold. The next apple dessert is not your typical homemade apple pie recipe, but it makes one that tastes just like it - but with frosting. Delicious. Loving this homemade apple pie recipe. In a large bowl, combine sliced apples, sugar, cinnamon and 2 tablespoons flour. Place filling in an even layer over prepared crust. Thinly slice 1/2 cup butter and evenly distribute over the apples. Roll out the remaining dough and place over the apple filling. Seal edges and prick the top all over with a fork. Bake for 30 minutes. Cool 5 minutes before frosting. This homemade apple recipe is a keeper because you do not have to make the filling from scratch. So rich with the cream cheese and is so easy to make. Combine flour and salt in mixing bowl; cut in butter until mixture is crumbly. Sprinkle water over mixture a tablespoon at a time while tossing lightly with a fork until dough holds together. Divide in half. Flatten to 1/2 inch thick and smooth edges. Roll out one portion on a floured surface to fit into a 9 inch pie pan. Place loosely in the pie tin. Mix pie filling with the spices and lemon zest. Pour into the pie pan. Combine remaining ingredients; beat until smooth. Pour over the apple mixture. Roll out remaining dough and fit over the pie. Cut slits in top for steam to escape. Sprinkle crust with white sugar. Bake for 25 to 30 minutes. Cool and enjoy. I have more than just homemade apple pie recipes, please check out more easy dessert recipes below.